Happy days: PhDing at the NHM with the holotype of Polacanthus foxii. We rightly hear a lot about early career researchers (ECRs) and the trials they face as they embark on their careers as scientists and academics, a daunting and challenging time in any scientist’s life. However, there is also a smaller group of people active in academia who are a bit longer in the tooth and might well have already had a career, or at least still be in the middle of one. These are the mature students, and I was one of them. Growing up, university was never mentioned at school or home, except once when my physics teacher told me he’d buy me pint when I got my degree. University was not on the radar at all, it was an option so out of my reach that it was never discussed, ever. It never occurred to me I could go on to higher education. So I went to art school, got my graphic design qualification and that’s been my career for over 30 years, the last 14 of them running my own business. When I was offered the opportunity to study for a self-funded, part-time vertebrate palaeontology PhD at NOCS, I was both surprised and excited. I went through the process of application, had my interview (toughest I’d ever done) and to my joy and amazement was accepted. I was very happy; here was a chance to make up for opportunities I didn’t have when younger. I was the first of my family to go to university. Part of the reason I left salaried employment to run a business was that I wanted to study more, but the reality of being a sole trader made that difficult to achieve, and this became clear in the first couple of years. Structured courses were problematic as my day job comes first and I ended up missing exams etc to meet deadlines; weekends were spent working and lessons would be missed, and even part-time distance learning proved to much. Work comes first, end of. No work, no money. The PhD was different. I could plan my research and even if I didn’t go near it for months could come back when things were quiet and resume without problem. Even on days I was stacked with work I could move my research on even if only incrementally. I’d send an email, download a paper, make a note of something, process data on an idle machine or any other of the myriad of activities a PhD student has do. It didn’t impact my work, but the tiny tasks returned tangible results, gave me a sense I was still progressing and during downtime I could make good headway. I enjoyed this period of my degree immensely. I was learning and becoming part of the wider community of palaeontologists who work on vertebrates. Even though I was 200 miles from the department I felt part of the Vertebrate Palaeontology (VP) group. The PhD began to feed back into my day job in ways I'd never anticipated, but were enormously beneficial. Our VP group were a busy bunch. We hosted international vert palaeo meetings, we talked about our research, presented posters, taught and gave workshops and I co-supervised a brilliant MRes student. I was making good progress, my panel were happy and I was preparing to upgrade, and then my supervisor left, suddenly and without warning. Following this event issues with the specimen I was working on came to light (and was totally unaware of when I started), and over a period of several months my PhD imploded completely. Things went from bad to worse. The senior staff simply did not seem to give a damn about my PhD. In my first call to one of them when I told her I had no undergrad or masters her exact words were; “How did you get in?”. It was suggested I could move to an MPhil instead as a consolation; my PhD was dead in the water, they had decided. The issues with the specimen meant that even this became impossible and the legal department pretty much stopped answering my emails. I became stressed, developed alopecia (my beard hair fell out in patches; it’s grown back now) and in the face of utter indifference from the senior staff I withdrew; I had no choice. My fees were returned but it was a financial disaster as I’d spent as much again on my doctorate, an investment with no return. As for the time invested… best not think about that. I probably could have handled it better in some ways. I am very honest with my clients, and this sort of candour which is essential in business was not appreciated by the senior staff. I reply to emails, I keep people informed and if there is an issue I let them know at the earliest possible opportunity, however difficult this might be to inform them of. I didn’t know how an institution like a university works as I’d not experienced it before. I was angry and upset and this hinders communication (I still am, and having spoken to friends whose PhDs were also ended through no fault of their own it’s likely I will be for a long time). It’s an oft-repeated myth that for those of us without a degree that life experience is taken into account when older students apply for higher degrees. True, I DID get accepted at NOCS on this basis (my day job meant there was some crossover in both the technology and ability to plan and execute large projects), but had the person I spoke to on the phone been in charge, I’m inclined to think I wouldn’t have. I’m now not sure I ever will again. Universities have a duty of care to all their students, from ECRs building careers in a competitive and challenging environment to the late comers who want to try to realise some of their own potential that they weren't in a position to earlier in life. Older students can find universities intimidating places (EVERYONE is so much cleverer than you) and when things go wrong senior staff have to treat mature students as equals and with respect, not as some sort of irritating distraction. I was deadly serious about my PhD, but it turns out the senior staff at the school were not. All students, including the older ones, put their trust in senior staff and do not expect to be let down in such a manner, and in the case of the VP group we all were. Positives? There are plenty. I learned a lot and loved being a VP PhD student. Most other palaeontologists have been fantastically supportive and understanding of the situation and I am looking forward to the future with an exciting project in the pipeline, working with people that I admire and can learn from and I look forward to contributing to the science. For a non-academic academic, I’m lucky to have such an opportunity. More on that later. Had I failed at my PhD because I couldn’t complete for some reason of my own, such as being intellectually or academically incapable, financially compromised or whatever else that would have been one thing, but to fail because of the (in)actions and indifference of those who are in a position to ensure all students are helped through tough times? That should worry all of us. Reconstructing fossils digitally has become a vital technique in palaeontology in recent years. The ability to reconstruct the entire skeletons of extinct taxa gives us the opportunity to look at aspects of an organism’s life that would prove difficult or impossible using physical models, for example in biomechanics and gait analysis. Er, hi. The final, posed Gorgosaurus model, created in zBrush 4R7 and Cinema 4D R16. 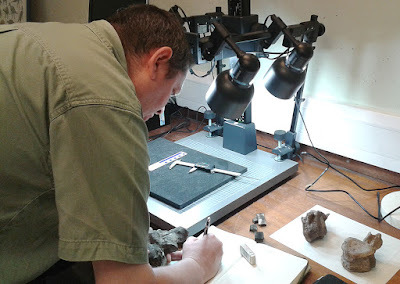 A recent paper by Stephan Lautenschlager (http://rsos.royalsocietypublishing.org/content/3/10/160342) on digital fossil restoration techniques provides a good overview of the methodology using tools available for digital palaeontology in most labs, including Avizo, Blender and Maya. 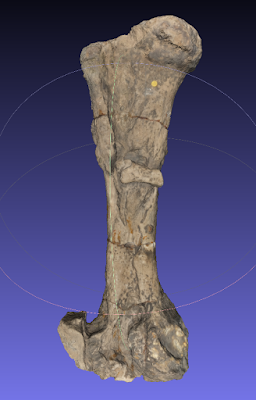 I highly recommend this paper for anyone interested in the digital restoration of fossil specimens and the workflow involved, much contained in the paper being relevant to the digital reconstruction of specimens for research and outreach. and suitable for use as a basis for reconstruction of the bone. The reference used to create individual elements comes from a number of sources. Primary amongst these are meshes generated using with photogrammetry, Lidar or CT scanning. These data are often received as point clouds that require the generation of a mesh. These datasets can be pretty hefty (especially if they are of entire mounted skeletons or other large, complex subjects) so they require chopping down into manageable chunks prior to meshing to make processing more efficient, for example isolating part of a limb or the skull. I use MeshLab (http://meshlab.sourceforge.net) for this part of the processes, saving sections of the point cloud and meshing them individually. The meshes generated from this procedure are the basis for the reconstruction and these are imported as reference meshes into the main 3D package prior to starting modelling. The literature was consulted and where possible collections were visited and photographs taken to maximise the available reference for modelling. This is important because as there is a fair amount of morphological variation within a particular taxa and this needs to be taken into account when modelling the skeletons, and in fact the final models are composites and don’t represent a single specimen. Like many studios I use more than one application to create my models of palaeontological specimens. As mentioned earlier, the main 3D application I use for both research and commercial work is Cinema 4D R18 by Maxon (https://www.maxon.net). Within C4D I block out the basic form of the model by generating primitives, extruding polygons and dragging edges and points into approximate position (see this post for how this works: http://paleoillustrata.blogspot.co.uk/2011/09/building-dinosaur-pulling-polygons-and.html). 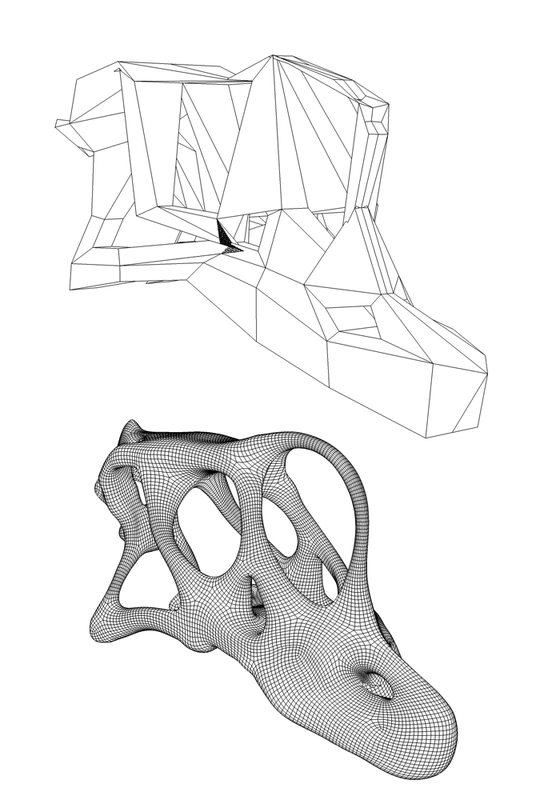 To make these models practical for biomechanical work and 3D printing, so they needed to have as few polygons as possible whilst retaining accuracy. By starting with very simple, blocky shapes it is far easier to keep control of the polygon count as you model and make sure the mesh density is as low as possible for the final model. and the skull in the process of being modelled at a higher resolution. Once the basic shape is modelled in C4D, the meshes (both reference and model are imported into Pixologic zBrush 4R7 (http://pixologic.com), a 3D modelling package that uses sculpting in clay as a metaphor for modelling 3D meshes. Why not continue modelling in Cinema 4D or anther package? Well, zBrush’s tools are intuitive, fast and easy to use (once you’re used to them) and well suited to creating organic shapes. As a modelling tool widely used in the gaming industry zBrush also offers excellent retopologising and mesh decimation tools, which means models can have a low mesh density whilst retaining detail; it produces very ‘clean’ meshes which are perfect for importing into a wide variety of other applications. Once the model is completed the final mesh is imported back into Cinema 4D for positioning and texturing (if required). I cannot recommend zBrush highly enough for organic modelling and anyone creating reconstructions in 3D should take a close look at this package. 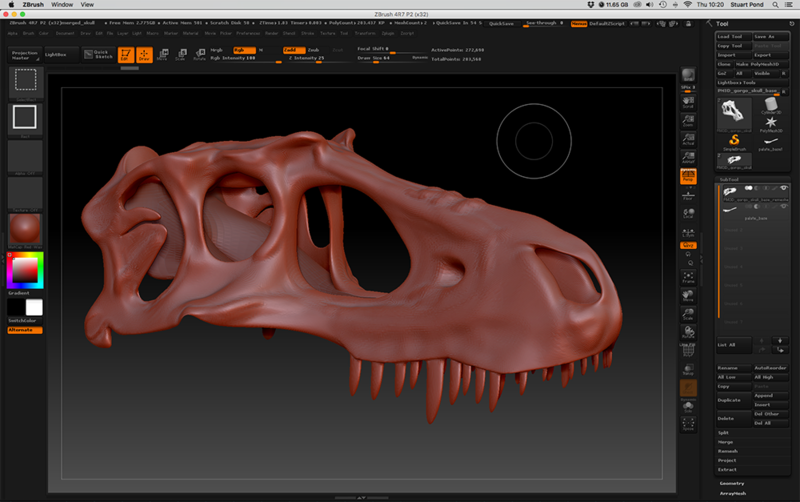 The skull of Gorgosaurus during the modelling process, showing the layout within zBrush 4R7. Assembling a skeleton in Cinema 4D is a task made easier by some of the tools that are add-ons to the application and widely used by modellers and animators. Foremost amongst these is the Mograph module, which allows the cloning of a single element and the manipulation of these clones. This is tremendously useful when creating multiple copies of broadly similar elements such as vertebrae. For example, the tail several vertebrae from certain points along the sequence would be modelled and then those in between generated by cloning and these would then be adjusted individually to match the reference. The Triceratops skeleton rigged and hot to trot in GaitSym. The final model can be exported out as any type of 3D file, with the most useful being .obj and .fbx at present, but anticipate this changing in the future and save in several formats as well as the proprietary format of the modelling applications. The use of commercial tools such as zBrush is becoming more common for palaeontologists and palaeoartists, and by paying close attention to the structure of production pipelines and workflows of commercial digital studios is something we as palaeontologists should consider, as there is much to learn from their techniques and methods which we can incorporate into our own reconstruction and restoration arsenal of techniques for generating 3D meshes useful or wide variety of research pathways. Horshamosaurus: An enigmatic Wealden ankylosaur. 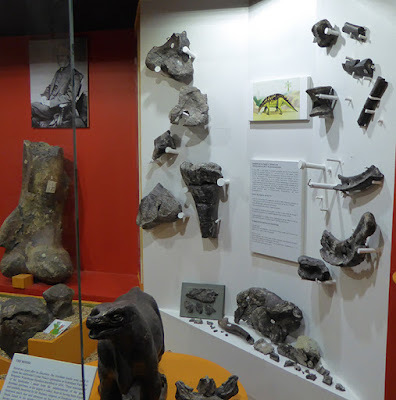 I recently visited the small but excellent museum in Horsham to take a look at one of the most enigmatic dinosaurs found in the Wealden, Horshamosaurus. Of the three species of Early Cretaceous ankylosaurs currently recognised in the English Wealden, Horshamosaurus is the least known. The specimen was discovered in a brickworks quarry near Rudgwick, Sussex in 1985, in the Barremian-aged rocks of the Wealden Sub-basin. Somewhat typically for Wealden dinosaur remains there is not much of it and whilst Hylaeosaurus and Polacanthus foxii are known from partial skeletons, the material representing Horshamosaurus is more fragmentary and consists of only a few elements which were found associated but disartuclated. The fossils were originally assigned by British ankylosaur expert Bill Blows to Polacanthus rudgwickensis, as it displays some affinities with Polacanthus foxii, the majority of which specimens come from the Wessex Formation but with one specimen having been found in the earlier Valanginian Fm near Bexhill, Surrey. Horshamosaurus shares several synampomorphies with Polacanthus: unfused caudal chevrons, astralagus fused to the tibia and similarities in the dermal armour, but the paucity of material associated with this specimen is problematic. 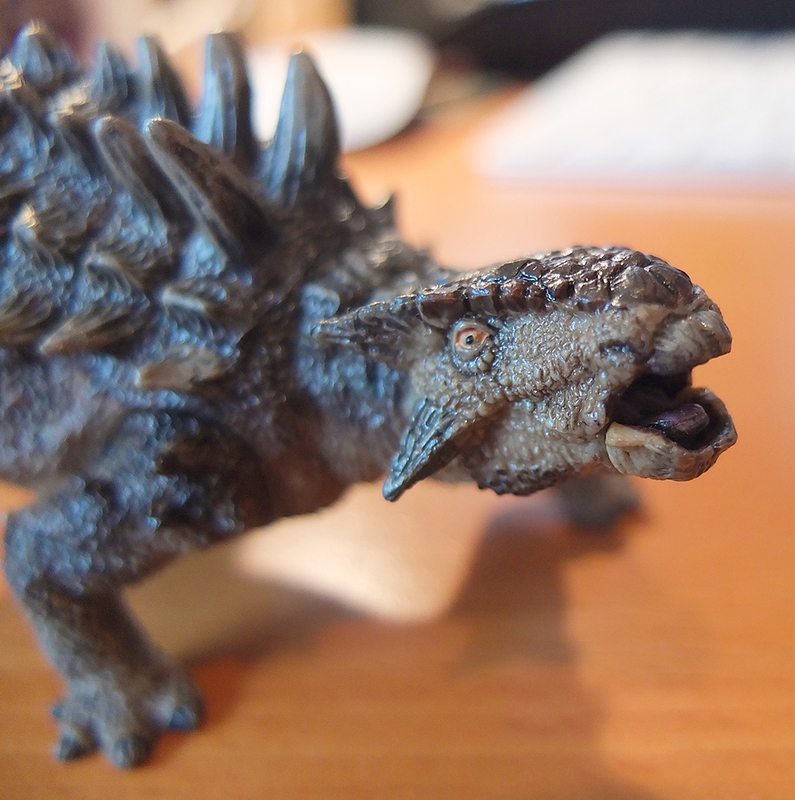 There are some differences between the Rudgwick ankylosaur and Polacanthus foxii too. It's suggested that Horshamosaurus is significantly bigger than the P. foxii holotype, around 30%, but this estimate must be viewed with caution and requires further testing. It also displayed differences in vertebral morphology and the length of the tibia, plus the geological occurrence of the skeleton indicated it was not P. foxii. In his recent book Polacanthid Dinosaurs of Britain (see my review here), Blows re-assigns P. rudgwickensis to Horshamosaurus and suggests it is perhaps a nodosaurid and not a polacanthid based on a reassessment of the character differences between it and P. foxii. Of course, the existence of a monophyletic ‘polacanthid’ clade is not settled. The main parts of the specimen consist of one complete dorsal vertebra and one broken, a couple of partial caudals of which one is a left half only, some rib sections including the proximal part of a large dorsal rib, the distal end of the scapulocoracoid, two osteoderms, the distal end of left humerus and the proximal and distal sections of the right tibia; the tibia is broken into two parts and a section of unknown length is missing. 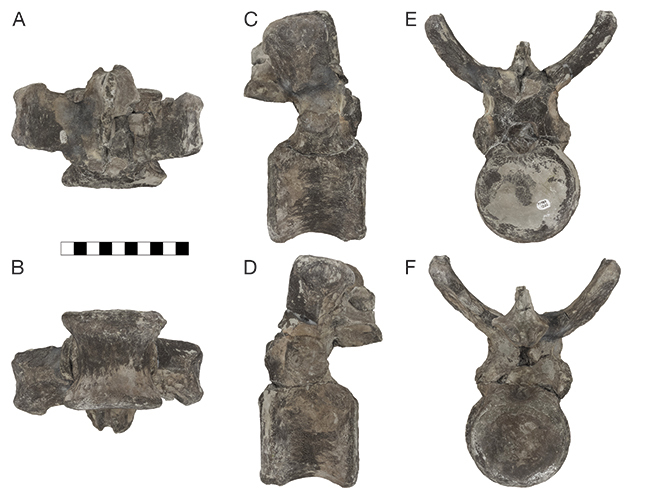 The scapulocoracoid is distinctive but the pectoral girdle of Polacanthus is poorly known, with only the Bexhill specimen and a specimen in private hands having part of the scapular preserved, however this appears to be less robust than Horshamosaurus. The Horshamosaurus scapular and coracoid are fused, this condition is not known to be a characteristic of Polacanthus as the coracoids of all the other published specimens are missing..
Of the two osteoderms preserved, one is a partial roof-like, thin-walled osteoderm, the other a large keeled osteoderm with a solid base. In his 1996 paper describing the specimen Blows suggests that the thin-walled osteoderm might be indicative of an ankylsoaurid affinity for this animal; there is some support for the taxonomic utility of ankylosaur osteoderms so this could be significant but as this is not a commonly seen morphology in Wealden ankylosaurs a larger sample size of these osteoderms is needed. Horsham museums's dinosaur display cabinet, with Horshamosaurus on the white wall on the right. The reassignment of Horshamosaurus by Blows in his 2015 book is tentative and hopefully more remains of this enigmatic armoured dinosaur will be unearthed in due course, which will enable us to resolve it's taxonomy and shed more light on the relationships of Wealden ankylosaurs. In the meantime, if you're passing close to Horsham I can recommend dropping into the museum to see their vertebrate palaeontology collection which is small (one cabinet), but contains the world's only known Horshamosaurus. Dr. 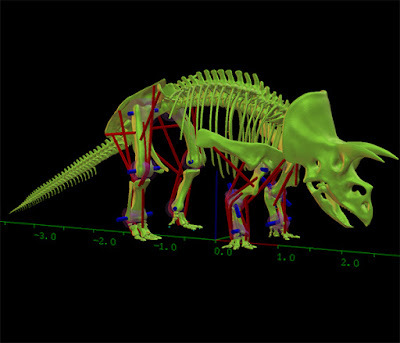 Sellers has been working on the biomechanics of dinosaurs and other tetrapods for several years and has developed an application called GaitSym that calculates walking or running gaits, testing walk cycles until the program finds the most efficient which can help form a hypothesis to be formed on how an animal might have moved around. GaitSym requires 3D skeletal data in the form of scans or models that are then rigged with muscles that allow the simulation to calculate the forward dynamics. Dr Sellers then built a new version of GaitSym that allows people to control dinosaurs themselves. By replacing the algorithms that calculate forward dynamics with an external control system, in this case a Kinect for Xbox wired up to a Windows PC, a person standing a few feet away can control the rigged dinosaur on the screen, enabling it to walk, run or dance. 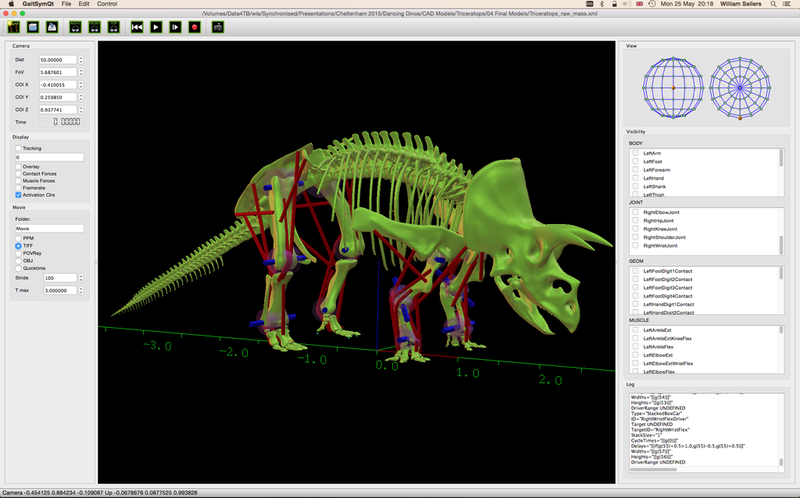 Triceratops skeleton rigged with virtual muscles in GaitSymKinect. Image courtesy of Dr. William Sellers. My part was to create the dinosaur skeletons to be used in GaitSymKinect whilst also making them suitable for being made freely available for 3D printing and just about anything else a 3D mesh can be used for. The skeletons were created to be as accurate as possible whilst not representing an actual specimen; scans, photogrammetry and the literature were all sources referred to when creating the skeletons. They are not detailed down to the smallest foramen in order to keep the polygon count as low as possible but they are accurate and would be useful for adapting to specific specimens if required and were created in Maxon Cinema 4D R16 and zBrush 4R7. 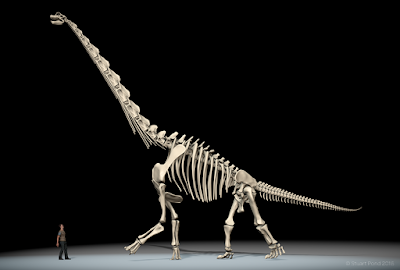 Six complete skeletons were created: Tyrannosaurus, Gorgosaurus, Triceratops, Edmontosaurus, Brachiosaurus and Edmontia. The final skeletal models are ideal for biomechanical work, adding to artworks and of course 3D printing. 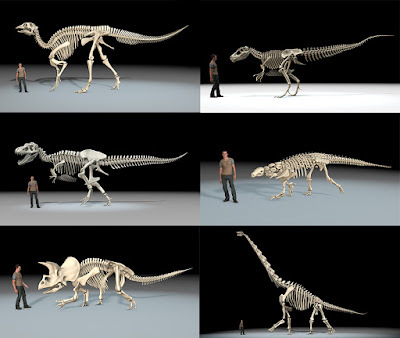 All this and they are free, released under CC-BY The dinosaurs skeletons modelled are shown below. If you do use them for anything, it’d be great if you could show us what you’ve done with them. The six dinosaur skeletons built as 3D meshes and available for free download. 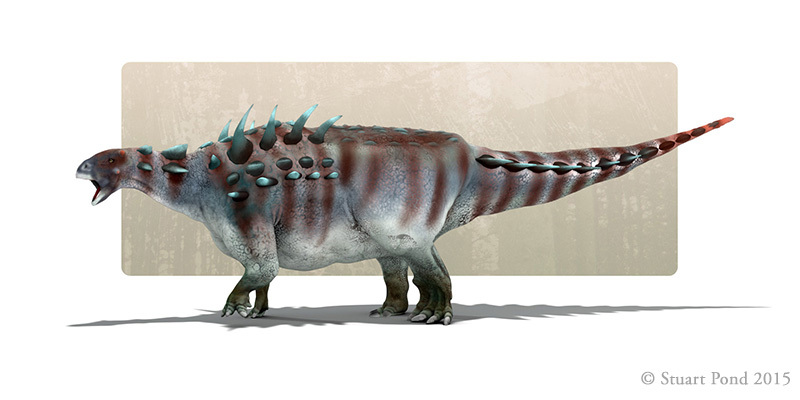 Tentative reconstruction of the ankylosaur currently under study at the University of Southampton. It would not be unreasonable to say that since their discovery in 1832 in a Sussex quarry, ankylosaurs have had a far more modest amount of attention directed at them than some of their more famous relatives. This may seem odd as the first to be discovered, Hylaeosaurus, was one of the three taxa that led Owen to erect the Dinosauria in 1842 and was the subject of one of Waterhouse Hawkins superb reconstructions at Crystal Palace. It seems that despite their spectacular array of spikes, clubs and shields they might forever be in the shadow of taxa considered more exciting by both palaentologists and the public alike, so a book dedicated to British ankylosaurs is a very welcome addition to the palaeontological literature. William Blows has been working on British ankylosaurs for several decades and discovered and excavated one of the specimens discussed in this book (NHM R9293) and has published many papers on the subject in that time; he is probably the leading worker on British Wealden ankylosaurs. Siri Scientific Press, based in Manchester UK, are a prolific publisher of paleontological and natural history books and specialise in well-illustrated textbooks that often cover niche areas of interest, although they also publish more general volumes. One of their most recent publications was Dean Lomax and Nobumichi Tamura’s ‘Dinosaurs of Great Britain’, an exhaustive and lavishly illustrated review of British dinosaur specimens, some never figured before in the literature. British Polacanthid Dinosaurs continues in the same vein, although obviously concentrating on a far smaller number of specimens. The book begins with a review of British ankylosaur research (fronted by the excellent Neave Parker reconstruction) which discusses systematics, polacanthid synapomorphies, stratigraphy and possible relationships with other taxa, principally those from North America. This is followed by a historical account of the discovery of Hylaeosaurus and the subsequent milestones in British ankylosaur research. This includes some gems like the tale of Mr Lee’s lost sacral shield specimens (which I discussed here last year) and contains some wonderful quotes from early dinosaur workers such as Hulke and Nopsca. This chapter is a good overview of the subject and a welcome addition to the literature, putting modern research into British ankylosaurs into context. The main bulk of the book consists of descriptions of most of the currently known specimens, broken down into sections by skeletal element: skull and jaws, vertebrae and ribs, limbs etc and the descriptions of the specimens are clear and detailed. This part of the book contains many photographs and these images are of excellent quality, captioned with accession numbers and (with the odd exception) are accompanied by scale bars and are the real strength of this book for ankylosaur workers; these images are a valuable resource. Most of the known specimens are covered here, although some are being worked on and are not included (this does include the Soton specimen, although the parts of the specimen held at Dinosaur Isle are figured and described here). The remainder of the book is given over to a brief discussion of other polacanthids, especially the North American taxa and the re-assignment of Polacanthus rudgwickensis to the newly erected taxon Horshamosaurus which Blows now considers a nodosaurid and not a polcanthid. But there are a couple of issues. Firstly, who is the book aimed at? At £59 plus postage this is an expensive volume and running at 220 pages not huge (although no-one can doubt the considerable work gone into creating it) and this would suggest it was aimed at academic and avocational palaeontologists rather than amateurs and curious layfolk. On the other hand, the tone of the book is not written in the scientific prose we expect from a paper or technical volume and the referencing is inconsistent. It contains some jargon but is more accessible than much of the scientific literature is, presumably for the benefit of the lay audience, but this gives the impression the book falls between two stools. Secondly is the existence of the ‘Polacanthid’ clade. The author states his opinion on this subject right from the outset in the title of the book (as well as his distrust of modern phylogentics, stating: “It is possible too much faith is applied to cladograms”), and confirms his position in the text: Polacanthidae is a valid clade and most British ankylosaurs are polacanthids. A lay person coming to the subject via this book would be forgiven for thinking this issue is cut and dried, which it is not. There are conflicting hypothesis about whether Polacanthidae (a clade alongside Ankylosauridae and Nodosauridae) or Polacanthinae (a clade nested within either Ankylosauridae and Nodosauridae) represent a monophylectic clade. The author justifies his conclusion it is by citing support from Kirkland (1998), Carpenter (2001) and Burns and Currie (2014) as well as Martill and Naish (2001). Kirkland’s recovery of a polacanthine clade was based on morphological similarities between several taxa and supported by cladistic analysis, however Carpenter’s assignment of Polacanthus to polacanthidae was based on a priori sorting of the sampled taxa into the three clades which were then analysed. Martill and Naish (2001) adopt Kirkland’s suggestion of a polacanthid clade because of doubts about the evidence for polacathines as basal ankylosaurids rather then direct evidence to the contrary, whilst Barrett and Maidment (2010) adopt Thompson et al’s 2012 conclusion of these taxa as basal nodosaurids, however Arbour’s 2015 analysis of ankylosaurids recovers Gastonia as a basal ankylosaurid. There is much work to be done in untangling the relationships of basal ankylosaurs and at present the exact status of all British ankylosaurs are uncertain. If you’re interested in ankylosaurs at all then it’s worth buying this book; if you're interested in or work with Early Cretaceous ankylosaurs it's essential. In years to come I can see this book being a very useful resource for workers and other interested parties alike; hopefully in future editions we will see more specimens are they come to light and are made available. It is a good review of the field as it stands from an author with decades of experience of studying British ankylosaurs and the images are superb, the specimen descriptions are detailed and the history of ankylosaur research is a great read. If only it wasn’t so expensive. Arbour, V. M., M. E. Burns, and P. J. Currie. 2011. 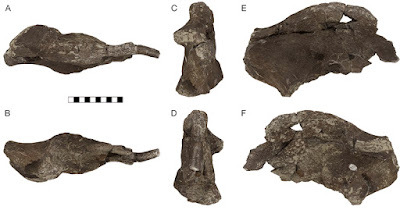 A review of pelvic shield morphology in ankylosaurs (Dinosauria: Ornithischia). Journal of Paleontology 85:298–302. Barrett, Paul M. and Maidment, Susannah C.R. 2011. Armoured Dinosaurs In: English Wealden fossils. Paleontological Association Field Guide to Fossils. Batten DJ, editor. 26: 391-406. Blows, William Taylor. 2015. British Polacanthid Dinosaurs. Monograph Series Volume 7. Siri Scientific Press. Manchester, UK. Carpenter K (2001) Phylogenetic analysis of the Ankylosauria. In: Carpenter K, editor. The Armored Dinosaurs. Bloomington: Indiana University Press. pp 454–483. Kirkland, J.I. 1998. A Polacanthine ankylosaur (Ornithischia: Dinosauria) fron the Early Cretaceous (Barremian) of eastern Utah. In Lucas, S.G., Kirkland J.I. and Estep, J.W. (eds), Lower and Middle Cretaceous Terrestrial Ecosystems. New Mexico Museum of Natural History and Science Bulletin 14: 271-281. Martill D, Naish D. 2001. Armoured Dinosaurs: Thyreophorans. In: Martill D, Naish D, eds. Dinosaurs of the Isle of Wight. London: Field Guide to Fossils No. 10: Palaeontological Association, 310–323. This years SVPCA meeting was organised by Gareth Dyke and his team and was held at the National Oceanography Centre Southampton (NOCS), home of Ocean and Earth Science at the University of Southampton. Situated on the bustling docks and surrounded by hulking container ships and the floating tower blocks that modern ocean liners all seem to resemble these days, this excellent facility is home to vertebrate palaeontology research in Southampton, located as it is close to the Jurassic Coast and the Isle of Wight. Following hard on the heels of the Flugsaurier meeting the previous week in Portsmouth and with the SPPC preparators meeting the day before, delegates convened on Tuesday 1st September to hear three days of talks, attend two poster sessions and various social events. 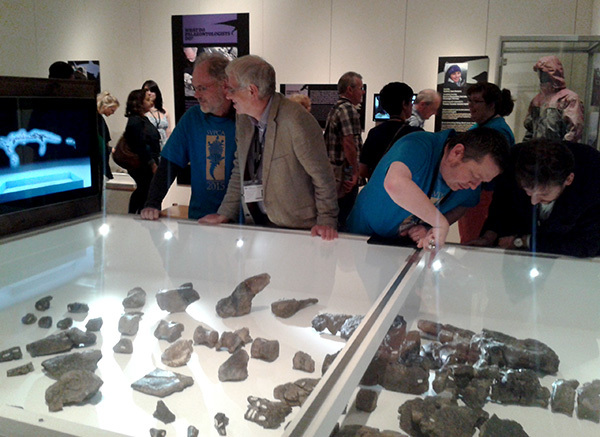 This year there were around 160 delegates attending, from emeritus professors to young palaeontologists, undergrads, postgrads, professional and amateur workers alike and palaeoartists were well represented. The SVPCA is always a more relaxing meeting than the SVP, less daunting to those giving their first talks and people there are always constructive with their advice. The talks were of a high quality and despite being restricted to 15 minute slots for both talk and questions didn’t seem rushed; the programme put together by Mark Young and Darren Naish contained a wide variety of talks that covered a satisfying wide variety of subjects. Even if a subject wasn’t particularly relevant to your own research chances are you left a session having learnt something or been found something to inspire new thinking in some way. There were no major technical glitches (although the movies didn’t work on my talk) and the sessions ran on time. There will be a special PeerJ volume based on papers arising from the meeting talks and posters, so if you did present it's time to get writing. Conversations went on well into the night in the pubs near NOCS. The annual auction at SeaCity Museum raised a fantastic £1900 thanks to the sterling work of Jeff Liston as auctioneers as well as the SVPCA A Team of Jessica Lawrence Wujeck, Aubrey Roberts, James Hansford and Liz Martin-Silverstone. The conference dinner was held in a dockside Thai restaurant and was very enjoyable, although being the day before the field trip . . .
Delegates inspecting the Wessex Formation at Chilton Chine, Isle of Wight. 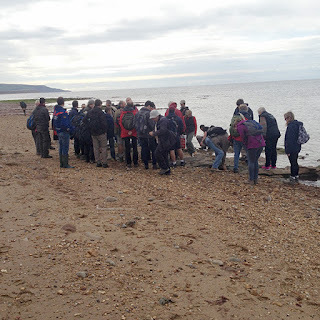 The field trip was led by Steve Sweetman and visited Brighstone and Compton Bays where the group took a long walk down the beach to inspect the fossil-bearing strata of the Wessex Formation, some of the most productive dinosaur localities in Europe. Dinosaur bone, plant material and dinosaur footprints were found. Lunch was taken at The Wight Mouse Inn, a pub beloved of the many vertebrate palaeontologists who visit the island. The next stop was at Dinosaur Isle where delegates saw the museum and the team of Alex Peaker, Shaun Smith and Gary Blackwell retrieved specimens for closer inspection and photography. The next meeting will be hosted by Liverpool John Moores University, and I’m looking forward to it already. As one delegate said to me before leaving, “it’s been inspirational”. You can’t really ask for more than that can you? © Stuart Pond. Simple theme. Powered by Blogger.